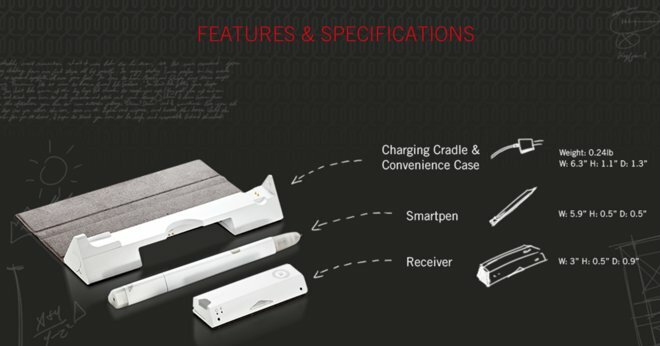 Any smartpen (from a serious users point of view) will quickly make their flaws stand out. Some I have used in the past have been uncomfortable to write with, some have fallen at the hurdle of being a pen, most just havent worked as advertised. As someone born in the last 30 years, I am part of a growing number of people that just don’t write. We were brought up among computers, and that has been our main input device. This has caused my handwriting to look like that of a child. Smartpens aren’t the solution to that problem though, so who are smartpens good for? People who take lots of notes, do diagrams, so designers, architects etc. This wont help me make my handwriting neater, but for taking notes in meetings, for people who draw a lot and want to share their pictures. 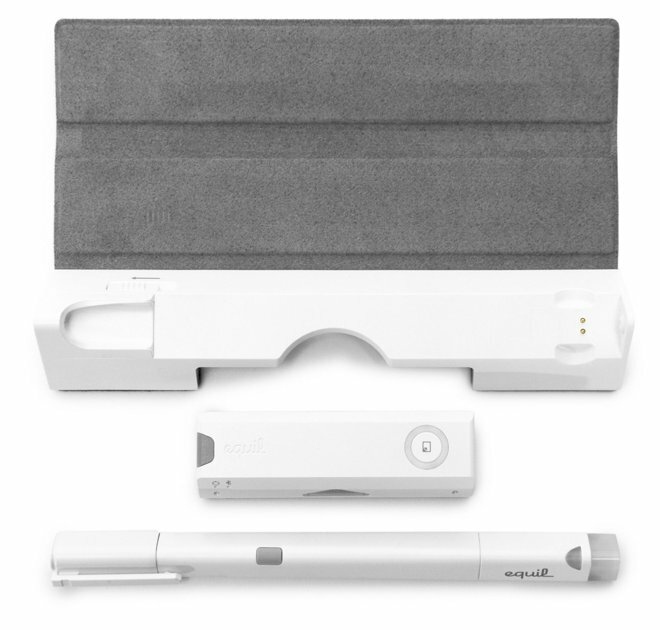 For anyone who wants to digitise their doodles, notes and diagrams, you should buy the Equil Smartpen 2. 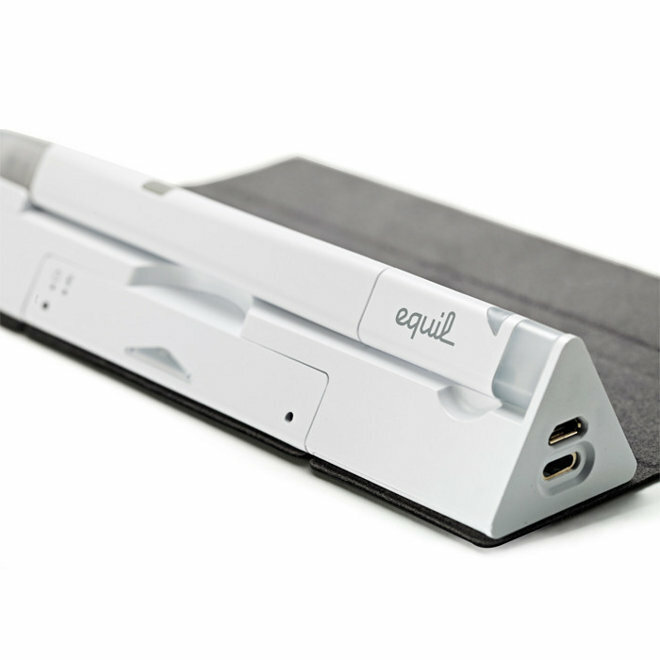 The Equil Smartpen 2 (E2) comes in a beautifully-designed, sleek, triangular dock/charger/storage case. It’s made of smooth white plastic, and it’s wrap-around cover is obviously inspired by Apple’s iPad Smart Cover. Contained within this small triangular dock is the pen itself, a spare ink cartridge, a USB cable, a cap and the receiver. Any smartpen first and foremost must be useable as a pen. 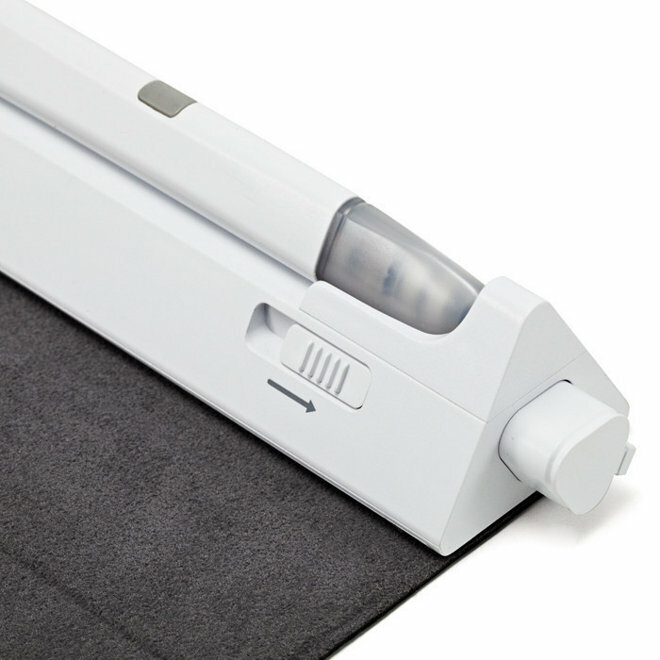 This means that it should be comfortable, and ideally be able to write on any kind of paper. The E2 meets both of these criteria. The pen is a comfortable triangular piece of molded plastic, it resembles a smaller version of the dock it charges in. One button on the side is there to turn it on and off, and a small LED built into the end acts as a functionality indicator. Anyone who uses this pen will instantly notice my one problem, the pen makes noise. It resembles a small electric razor, and though not loud, is noticeable. The sound is drowned out if you’re using it in a busy office environment. The noise may be the reason Jack Torrance (The Shining) lost his mind while trying to write his story. The receiver is the brains of the operation, and is what makes the whole experience work. It’s a small device, smaller than a pack of hubba bubba, which slides from the main dock with its own magnetically-latching under cover that allows it to be attached to a piece/pieces of paper. Initially I was slightly annoyed to be forced to clip a receiver to my pad of paper, but the way it works is genius, and means I can use this pen on any paper I choose. If you have a moleskin notebook, or a writers pad, or a small notebook, or an A1 pad of paper. If you can clip it on, you can use the receiver and pen. If I was to use one word to describe my E2 experience, it’d be Awesome. I may never type noted again, you can have it linked to your phone, and through the day write notes and doodles, and the receiver sends ever stroke to my phone. Connecting the receiver to my M8 was a piece of cake, and provided me with picture-perfect copies of my notes. I tested this on my M7 and Nexus 7 and didn’t have any issues connecting them. Equil provides two apps to use with the pen; Equil Note and Equil Sketch. Each one worked well. They sync with a number of services, including Evernote and dropbox. One area I was worried about was the battery. As smartpens in the past have run out rather quickly. But I was unable to run this pen out, the battery just kept going, and even kept up with me writing this entire review. I would like to express again, don’t depend on the E2 for great quality transcriptions of your handwritten notes. But you can depend on the E2 to capture anything and everything else you can write on a piece of paper, keeping digital copies handy for review later on. As an Android user I felt expected to be put off by the Apple-like industrial design, but it looks great and works really well on your desk. The pen was excellent at being just a pen, when I needed it to be, and allowed me to write on any kind of paper is a major plus. The only minus in a review of pluses was the slight buzz the pen produces when writing.